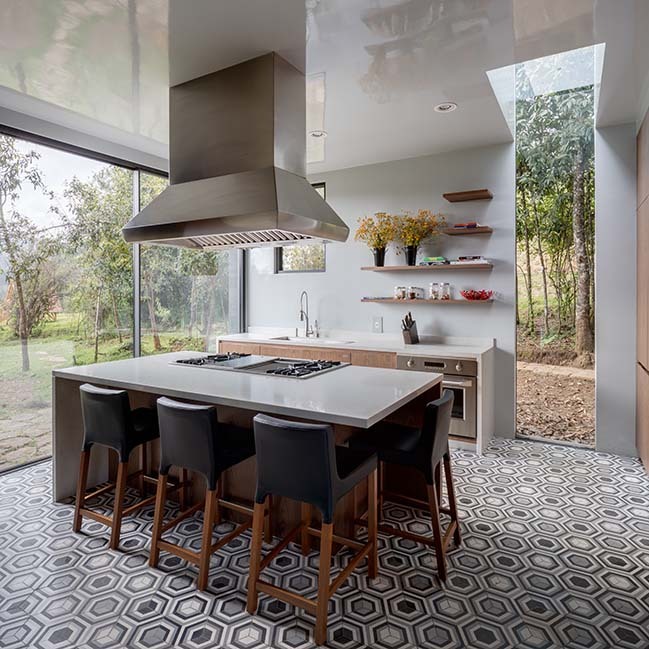 This project questions the archetype of the house and organizes different spaces around a central patio. This design solution was born out of the need to respect every existing tree on the site and to provide every space with sunlight both during the morning and the afternoon. 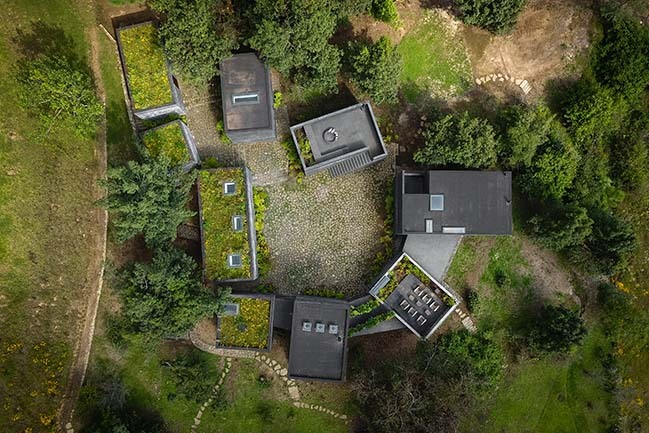 From the architect: The result is an “exploded house”, where the dwelling is composed of isolated volumes that are placed according to the views, the orientations and the existing vegetation. 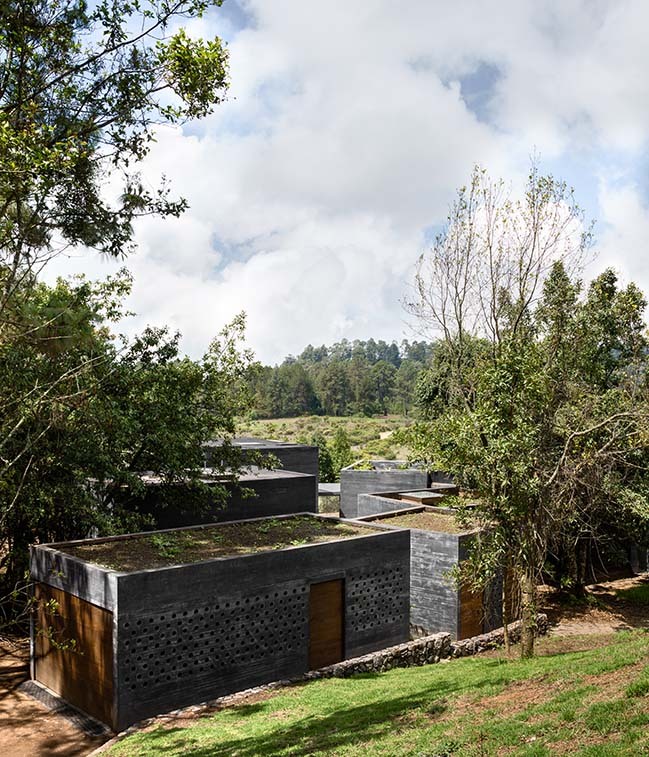 The program is distributed in nine rectangular volumes so that each area has privacy and, at the same time is related with the different spaces. 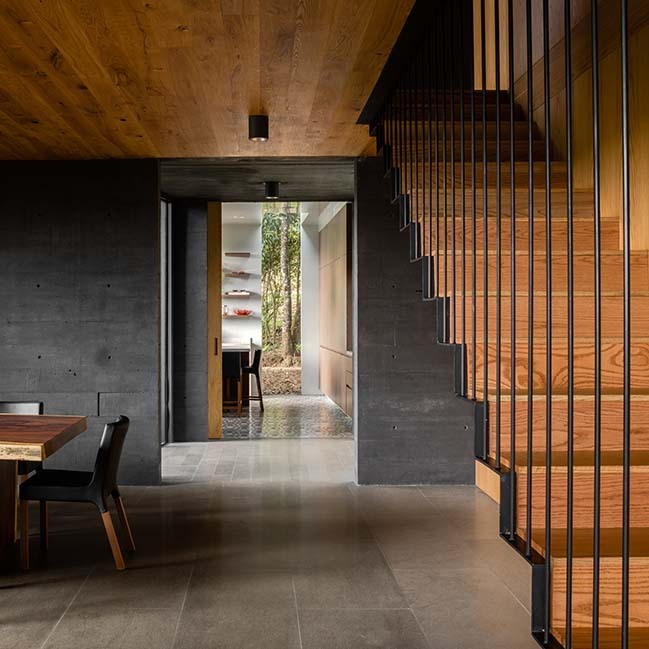 The volumes comprising kitchen, dining room, living room, master bedroom and kids bedroom are connected through covered walkways. 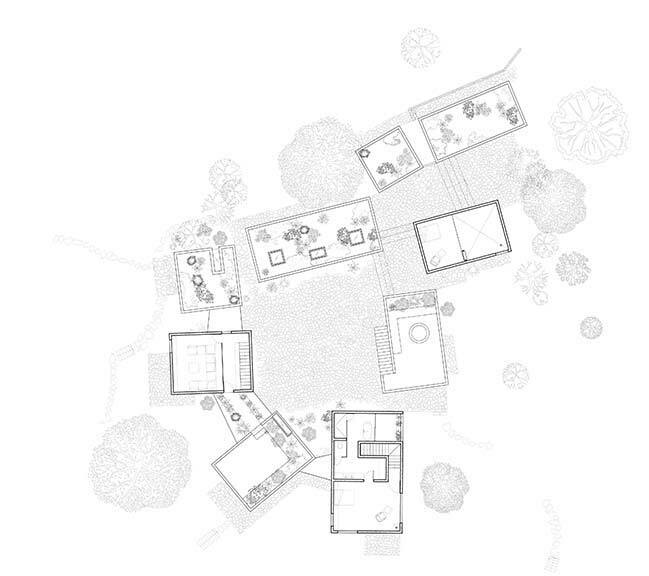 The remaining volumes: two guest bedrooms, services and the garage, shape the other side of the central patio. 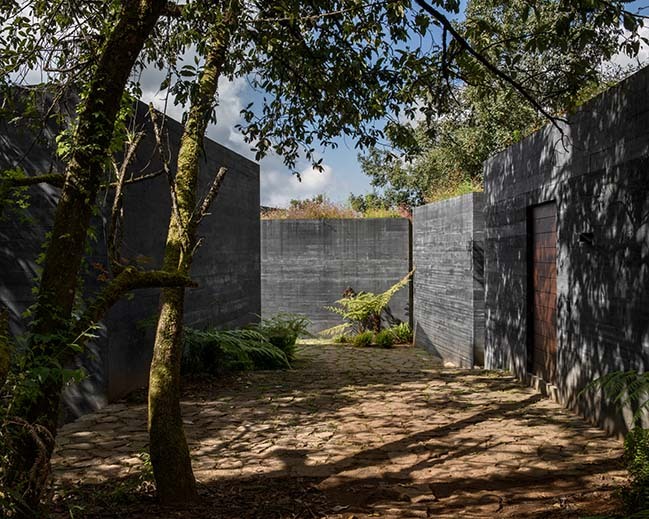 Each space is linked to this patio and opens towards the opposite end, which allows for private views but also for spaces open completely to the landscape. Two of the volumes host roof terraces –one built over the living room and the other over a guest bedroom- allow for wide open views, while the rest of the roof tops volumes have gardens. 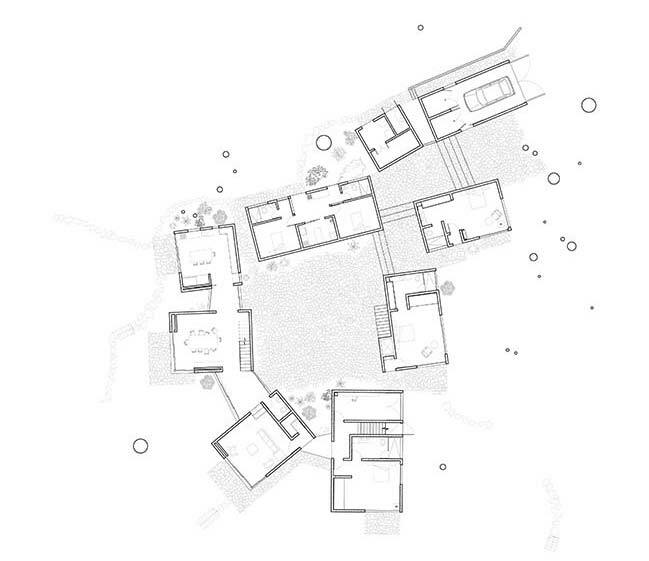 Each volume has a different height that corresponds to its topographic condition and to its spatial hierarchy. 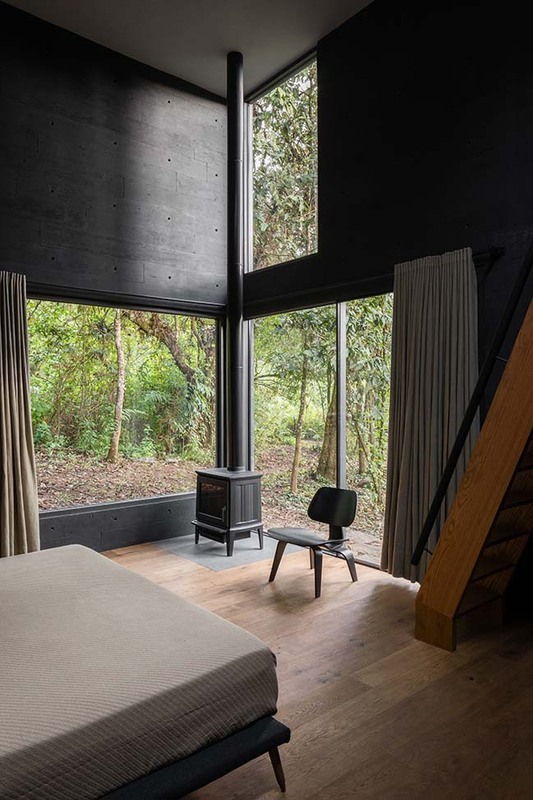 The master bedroom is located in a second floor, above the children’s bedroom and above a studio that opens up to a private terrace. A larger studio is located above the dining area and has a direct access to one of the roof terraces, which sits above the living room. An exterior staircase running alongside the main patio leads to the other roof terrace, which faces the mountain towards the East. The project highlights each volume’s independence, but also the interaction and sequence that exist between them. 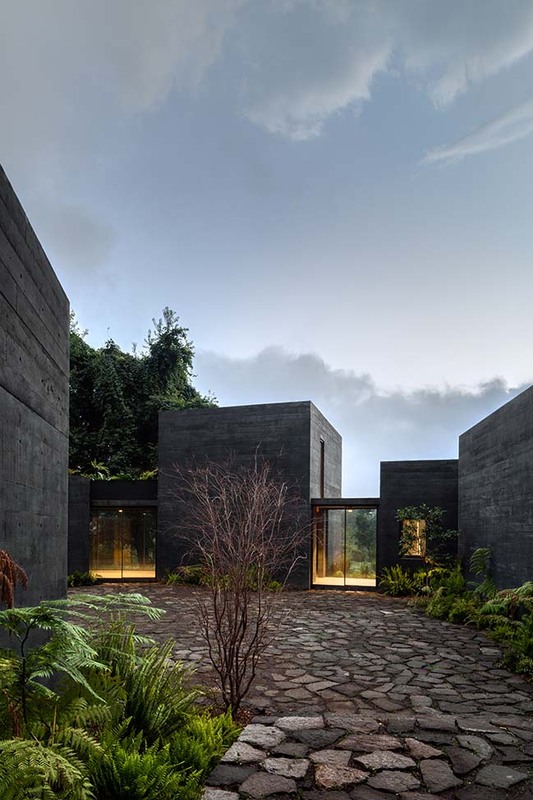 Only five materials were used throughout the house: black concrete, wood, stone, metal and glass. 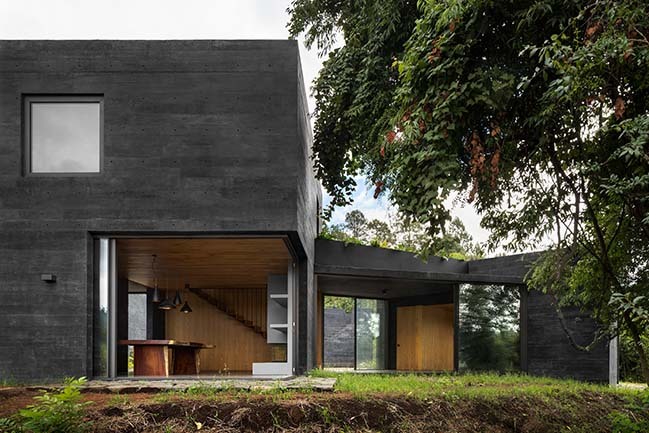 The structure becomes the architectural finish. 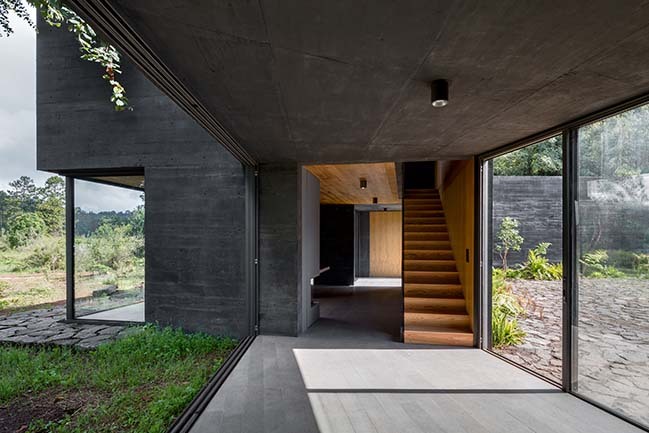 The dialogue between interior and exterior as well as the link between the different volumes generates a unified image within isolated structures. 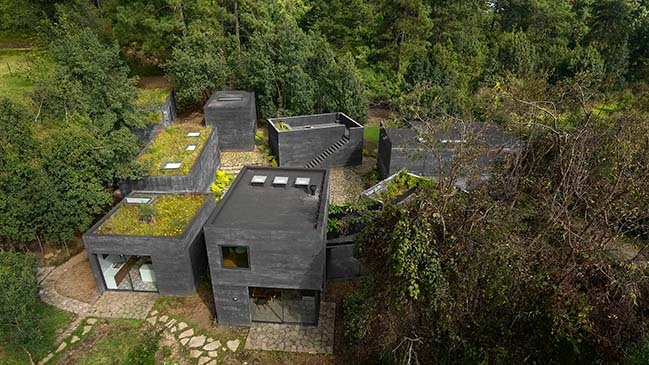 Each volume molds into the topography and makes the whole project seem to disappear into the landscape. 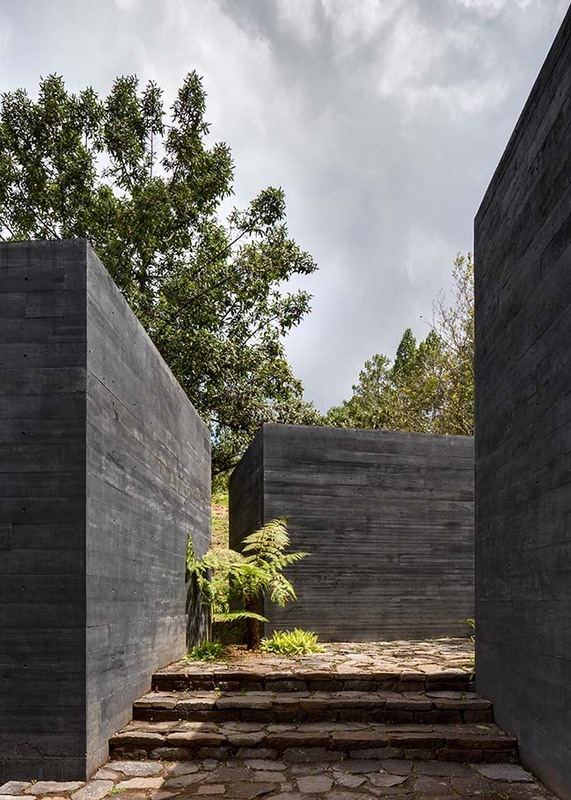 The black color and the roughness of the stone and of natural materials contribute to portray a timeless character. 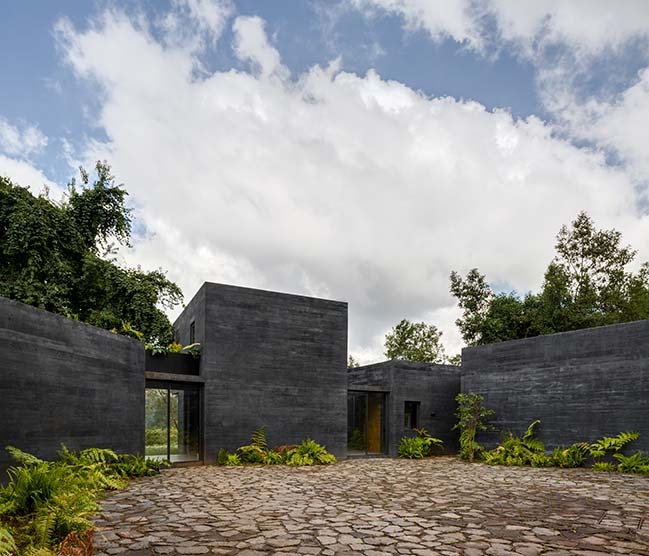 The entrance to the house is where this is most visible since it has a semi-hidden path where each volume appears slowly and culminates in the central patio and continues through the openings of the walkways that connect the main areas. 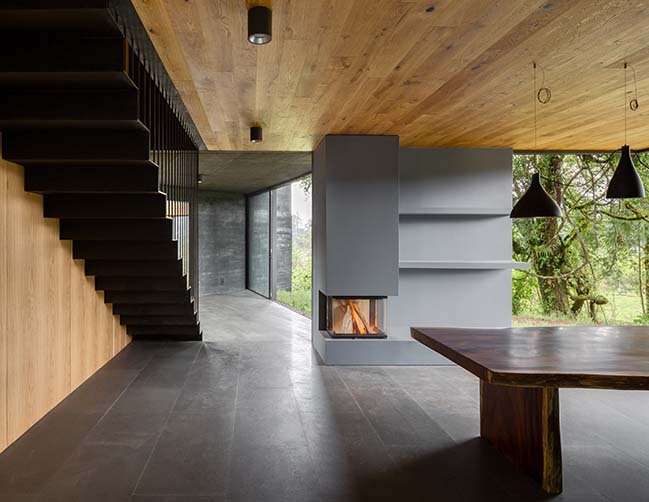 These walkways open to both the patio and the landscape allowing glimpses of the views that otherwise are not visible from this point. 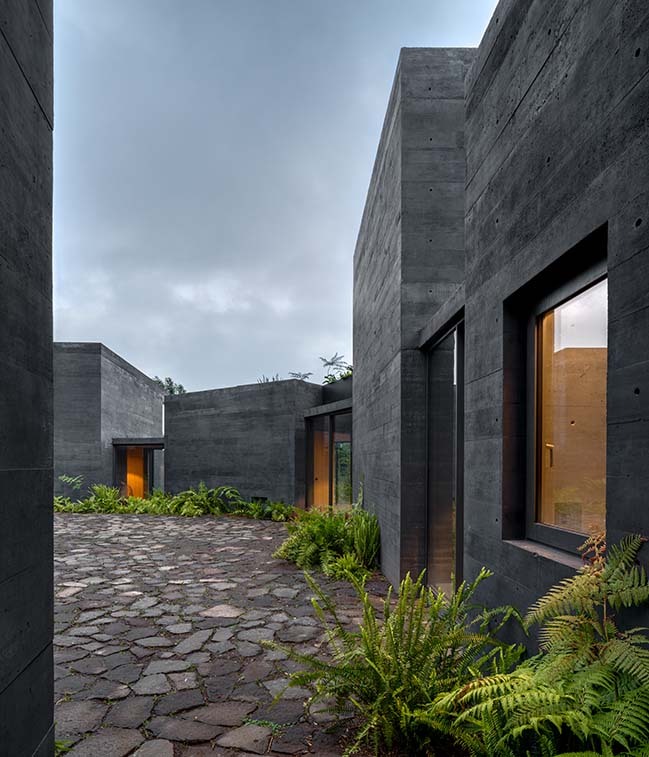 As the patio closes itself to the surroundings it also anticipates what is behind each enclosed volume, making each area a surprise.